Update: After this comic was published, the government made some reforms in response to a federal court ruling that the process to challenge inclusion on the No Fly List is unconstitutional. The government has now committed to telling U.S. citizens and permanent residents whether they are on the No Fly List, and it established a revised redress system. Those reforms, however, are not enough. The government still refuses to provide meaningful notice of the reasons our clients are blacklisted, the basis for those reasons, and a hearing before a neutral decision-maker. We’re still fighting for our clients’ due process rights. Read more. Picture this: You arrive at the airport, full of good spirits ahead of a work trip to visit to a client. You wait in line to check in for your flight, but when you reach the counter, you’re told you won’t be able to board. Suddenly you’re surrounded by security guards and hauled off for questioning, with everyone gawking at you. You learn that you’re banned from flying – INDEFINITELY – to, from, or over the United States, even though you’ve never been charged with a crime. You’re not told why. And there’s very little you can do about it. That is the reality of the No Fly List, a secret government watch list being challenged by the ACLU and its affiliates in Oregon, Southern California, Northern California, and New Mexico. To help illustrate the unfairness and devastating human cost exacted by the No Fly List, we enlisted the talents of award-winning comic artist Jen Sorensen. Share the comic, and read on to learn more about what’s being done. Picture this: You arrive at the airport, full of cheer ahead of a work trip to visit to a client. You wait in line to check in for your flight, but when you reach the counter, you’re told you won’t be able to board. Suddenly you’re surrounded by security guards and hauled off for questioning, with everyone gawking at you. You learn that you’re banned from flying – INDEFINITELY – to, from, or over the United States, even though you’ve never been charged with a crime. That is the reality of the No Fly List, a secret government watch list being challenged by the ACLU and its affiliates in Oregon, California, and New Mexico. 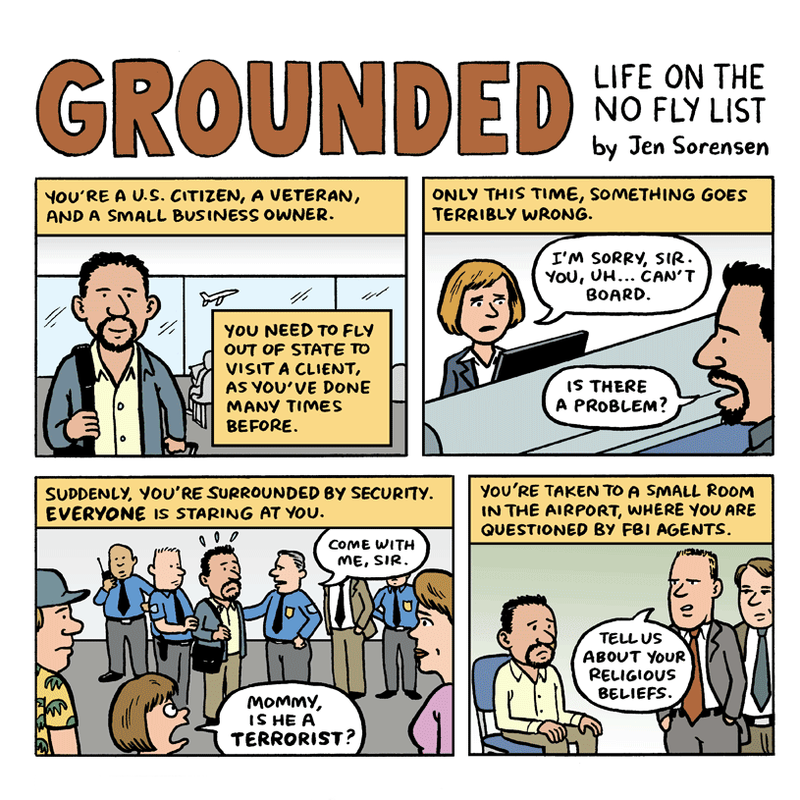 To help illustrate the unfairness and devastating human cost exacted by the No Fly List, we enlisted the talents of award-winning comic artist Jen Sorensen. You’re a U.S. citizen, a veteran, and a small business owner. You need to fly out of state to visit a client, as you’ve done many times before. Only this time, something goes terribly wrong. Suddenly, you’re surrounded by security. Everyone is staring at you. You’re taken to a small room in the airport, where you are questioned by FBI agents. The FBI says they’ll clear your name if you serve as an informant. By now, you’ve missed your flight, but that’s only the beginning… because you’re on the No Fly List. The client you were going to visit asks for a refund because you couldn’t make it. You aren’t allowed to go abroad to see your ailing mother. Job offers are rescinded. Your commercial driver’s license is revoked. You miss graduations, weddings, and funerals. Years go by, and you still have no idea why this happened to you. You have never been charged with a crime. In 2003, the FBI established the Terrorist Screening Center, which puts out a master watch list called the Terrorist Screening Database. Your high school English teacher would not approve. So… a suspected terrorist is someone suspected of terrorism. A subset of individuals from the TSDB are selected for the No Fly List, which gets shared widely – with the TSA, Customs and Border Patrol, and 22 other countries. We don’t know the criteria for this list, or how many people are on it. What are you told to do if you suspect you’re on the list? Submit a form to DHS-TRIP – a funny acronym, considering you won’t be taking any. DHS-TRIP is the Department of Homeland Security Traveler Redress Inquiry Program. Dealing with DHS-TRIP is a guessing game – guessing why the government blacklisted you, and whether you’ll ever be able to clear your name. The only way to find out if you’ve been removed from the list is to buy a ticket and try to board a plane. Short term parking? Long term parking? Could be either! Is anything being done to help? The ACLU has filed a lawsuit on behalf of 13 U.S. citizens and permanent residents who pose no security threat. Four of the plaintiffs are veterans. The case, Latif v. Holder, argues that current policy violates the 5th Amendment right to due process. It seeks a fair way for people to clear their names. "… nor be deprived of life, liberty, or property, without due process of law…"
Airline agent: "You’re at gate B5. Have a great flight!" Jen Sorensen's political cartoons appear in a variety of publications around the country, including The Progressive, Ms. Magazine, The Nation, Daily Kos, Medium, Alternet, and The Austin Chronicle. She is the winner of the 2014 Herblock Prize and a 2013 Robert F. Kennedy Journalism Award. You can see more of her work at jensorensen.com and follow her at @JenSorensen.